We appreciate your feedback about your support experience with OPMC, developers of WooCommerce Ninja Forms Product Add-ons. This helps us maintain high standards on the WooMarketplace, and helps OPMC improve. When purchasing products from your store, you require information from your customer. Perhaps you run a t-shirt printing company, and you require the customer to enter in the text they would like to have printed on the t-shirt. 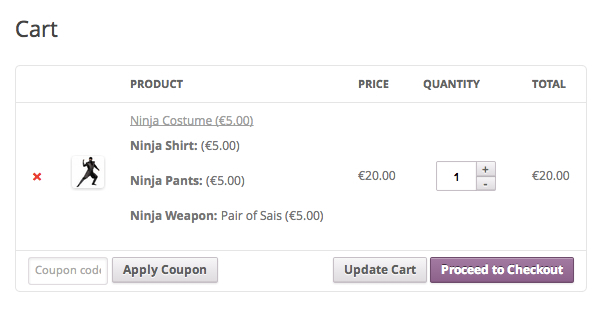 For this, you can add a simple text input field to your product listing, and charge an extra fee, using the Ninja Forms Product Add-ons extension for WooCommerce. Easily add form fields to your product detail screens. Ninja Forms is a popular free form creation plugin for WordPress. While most commonly used for contact forms and other such form-to-email requirements, the code is flexible enough to integrate seamlessly with WooCommerce products, using this extension. Optionally add charges to your added form fields, and preserve the information on the order line item. 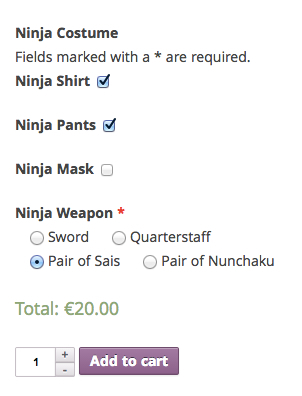 Assign a Ninja Form to your product, and have the form fields displayed on the product listing, enabling your store’s customers to customize the product before adding it to their shopping cart. Note: This plugin is currently not compatible with Ninja Forms 3.0. You need to use and download this file: Ninja Forms version 2.9.58.